To help better explain what a coating system is, I will put it in an easier to understand context. Roof coatings are a fluid applied system designed for waterproofing and improving building envelopes efficiency. They are sometimes over 60% solids by volume with adequate reinforcement with fabric. The application of the coating system looks much like a sandwich. For instance, the first coat is the bottom bun, and then the fabric (usually either cotton or polyester) is the patty or meat. Then the top coats as the top bun, to make up an assembly very similar to a sandwich. The demand of roof coating is growing day by day. And will continue to do so, as building owners and property managers become more familiar with the benefits. And that they can save their roof without having to tear it off as re-roofing can be far more costly. Always hire a reputable expert coating applicator, they will assure your system works as intend it to. Coatings just like roofs are only as good as their applicators. However, the technology of coating system varies, just as their application protocol, and types of warranties available. Few coating systems, such as IPC – Acrylink G are available with up to a 20-year total system warranty if you meet their qualifications and warranty protocols. Also, some systems are available with 7 to 10-year system warranties, which seems to be the most predominate warranty specification. There are 17 different types of roofs or wall systems that need coating, meaning you can pretty much coat anything. 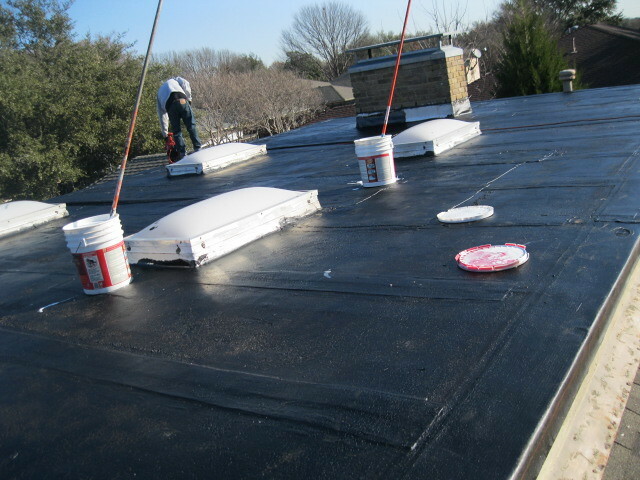 Most coatings undergo tests for roofing applications. Some coatings also undergo tests for vertical applications that show an improvement in energy efficiency and fire ratings. Particularly R Panel and U panel systems are great candidates for coating. Why? Roofers mechanically attach them on screws with neoprene washers with panels to the purling or building frame. Often over time the neoprene washers can dry rot, crack, and become deficiency laden which can cause leakage. Coating this type of roof system not only covers all the fasteners it essentially puts a solid blanket over the building envelope. This costs less than a replacement metal roof system. It also assures building owners that they will not have to worry about all the areas that are the typical sources of leaks. Plus, it improves the energy efficiency of the building envelope. Sometimes, it drastically enhances the original metal roof is of a darker color which absorbs more heat. Black, grey, or even gravel ballast roofs are great candidates for coating applications. Applying an Energy Star Rate coating system over these types of roofs prove to show immediate savings in energy consumption. In Houston, as well as most other municipalities only allow two roofs on your commercial building. There is no consideration of Roof coating, in Houston by code. Instead it is not actual roofing but more of a restorative and building maintenance procedure. There has been a recent, enhancment in the drainage requirements for retrofit re-roofs on buildings with parapet walls on all sides in the city. In doing so drainage requirements you must have approval by the plan review, prior to issuance of code compliant re-roofing project permit. Most older buildings that have parapet walls on all four sides typically have only primary roof drains. There are also wall scuppers that comprise their drainage system. Now that it is a requirement to have one overflow roof drain for every primary roof drain. This overflow roof will be nominally sized thru wall scupper outlets measuring 9″ in length by 4″ in height. Along with every primary scupper, an overflow must have an installation at an elevation, higher than the primary scupper. The elimination of certain drains and scuppers can be done with the addition of new drains. As long as you meet the drainage requirements and have pre-approval. In instances such as this, a coating application would not require enhancing the drainage requirements on the roof. This can provide substantial savings. Also, while making the building envelope more energy efficient and still meeting the required building code protocol. It will also potentially provide tax incentives for improving the building’s efficiency. 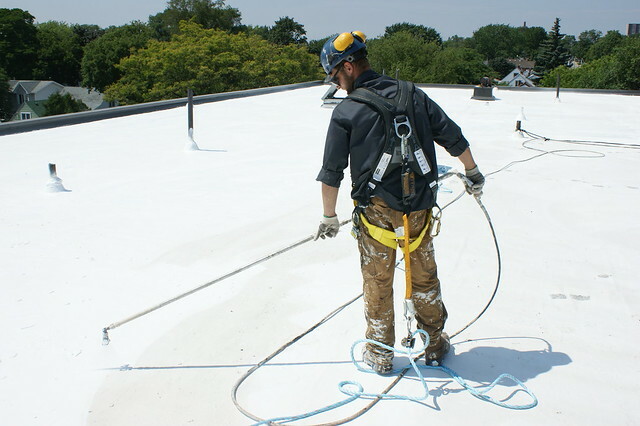 In some coating applications can save building owners a lot of money verse re-roofing. The IPC (Isothermal Protective Coating Field Representative Marcus Brown said to me and a client once, “It’s really simple, coat the roof, get a 10 to 20-year warranty against leaks, and kick the bucket down the road and quit worrying about your roof”. I concur. Coatings applications are like everything else, you get what you pay for. With so many products in the market, choosing the one that is the best requires an expert roofing professional. They will explain the differences in the different systems from warranty terms to technological differences between systems. With over 10 years of coating experience at Anchor Roofing, we are pleased to have never had a coating claim, and every roof that was coated prior to Hurricane Ike made it through the storm without one failure. There are coating manufacturer’s that will literally sign up anyone wanting to be a warranty applicator. Their goal is selling as much product as possible, as they are often frowned upon by architects and roof consultants. We also welcome the opportunity to provide further information about roof coatings and how practical their application is for buildings. This will help decide if it is an option we can recommend in good faith. Some roofs unfortunately just aren’t good candidates for coatings, particularly any roof with substantial moisture trapped underneath the present roof system. Some buildings are a great fit, and now between local incentives available and federal tax incentives along with decreased energy consumption more and more coatings are being applied than ever before in the US market. Anchor Roofing possesses certifications of warranty applicator for most of the top industry coating systems. This enables us to provide long-term total system warranties, and we have the manpower to handle any job of any size, be it large or small. Call your local Houston roofing contractor and schedule a free estimate and find out in what shape is your roof!